The Pew Research Center’s latest survey results reinforce that Internet users are not only using social media more, but are expanding to other various platforms. No surprise here – Facebook remains at the top for most popular social media site among Americans. However, it remained steady with 71% of internet users on Facebook, showing no change from August 2013. As online community managers, we understand the nuances between each social media site and how critical tailoring messages can be to the success of our social media marketing campaigns. We also know that not all social media sites fit a brand’s target market, and an organization shouldn’t pressure itself to be on all of them. With the large increase in growth for Twitter, Instagram, Pinterest and LinkedIn, brands should explore which networks work best for their target audiences. 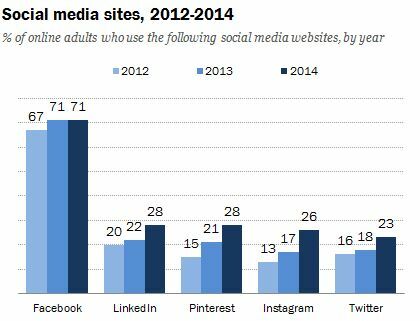 The Pew Research Center’s September 2014 survey showed that 52% of online adults now use two or more social media sites, an increase from 2013, when it stood at 42% of internet users. For more information on the survey, please visit the Pew Research Center’s website.